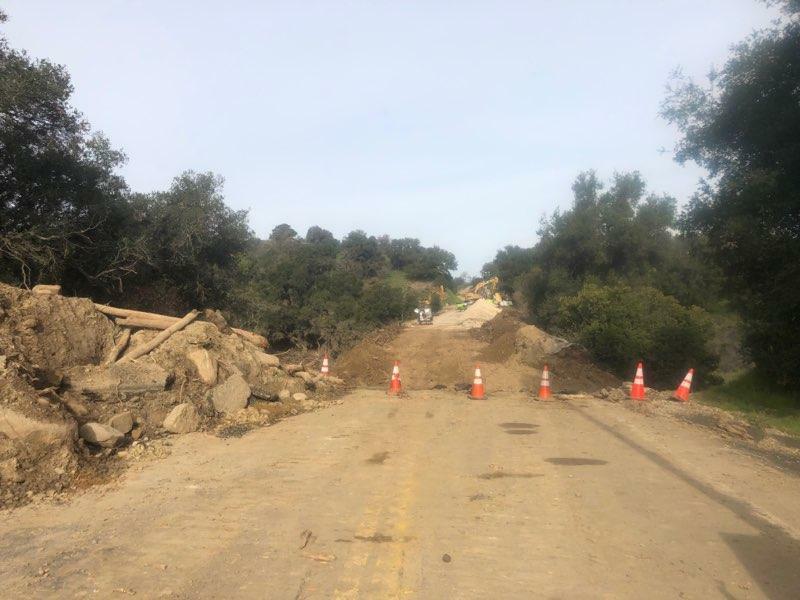 State Route 154 will remain blocked at Lake Cachuma through mid-March, Caltrans estimates. Caltrans workers have dug down 40 feet to the blocked culvert that keeps State Route 154 closed at Lake Cachuma. The state highway agency now estimates the road will remain closed until mid-March. CalPortland Construction of Santa Maria has been hired to make the repairs, at a cost of $2.2 million, which involves reconstructing the foundation below the culvert, repairing the embankment, and excavating and repairing part of the damaged highway, Caltrans spokesperson Jim Shivers announced in a press release on Friday. State Route 154, a much-used arterial that connects the City of Santa Barbara to the lake’s camping park and the cities beyond of Buellton and Solvang, as well as the Santa Ynez Valley wine country, has been blocked since a rainstorm on February 2-3 clogged it with mud, tree trunks, and rocks from the Whitter Fire burn scar. Those areas can be reached from the south by taking Highway 101 along the ocean to the 246 at Buellton.